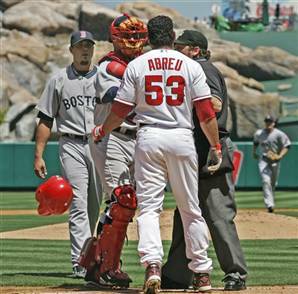 Josh Beckett was suspended for six games today for the incident involving the Angels the other day. This is effing ridiculous. Like the Red Sox need more problems right now. First off, it is very questionable if Beckett purposely threw at Abreu’s head. The whole situation is messed up. Beckett takes a long time to pitch, Abreu waits too long to call timeout, the ump calls timeout while Beckett is in his windup, and the ball sails above them all like every pitcher is taught to throw when a late timeout is called. The fact that Beckett was mid-throw when timeout was called should clarify why it was a crazy pitch. The guy wasn’t expecting it and probably cocked his arm a bit differently than planned. Now I’m not saying it’s not his fault, but there were three people in the wrong on this one, Beckett, the ump, and Abreu. So he got in a rage about words that were either said by the fans, the umps, or the Angels themselves. He seems stable. The fact that the umpires in the middle of the situation didn’t think it was malicious apparently doesn’t mean jack squat. Hell, they said that if the benches didn’t clear (which was started by the Angels), Beckett wouldn’t have even gotten a warning. So, given all of this, six games for Beckett and none for the Angels seems justified. Bud Selig needs to stop this shitshow of a commissionership and resign already. He’s effing awful. You are currently browsing the archives for the Josh Beckett category.